In the digital age, where nothing stays the same for very long, there remains one constant in the ever-evolving landscape Content marketing. What was once little more than a buzzword term bandied around by those in online business is now the central pillar of modern marketing across the world. This is largely due to the fact that stellar content has the capacity to enhance multiple facets of digital marketing, including SEO, branding, social media, and email. However, as the sands continue to shift, content marketing is getting more competitive, and increasingly challenging over time. But make no mistake, it can still be the rock-solid foundation you need to build your brand upon. The trick is knowing what to focus on. In this article, we’ll explore the best modern techniques for content marketing, so your business can thrive online in 2019. It’s easy to get overwhelmed by the plethora of tools and channels available today. By focusing on these areas, you can maximize your return on investment (ROI) with the avenues that generate real results. Years ago, content marketing amounted to little more than written blogs, and the general consensus was posting as much as possible was the way to go. Back then, content didn’t last long in RSS feeds online, so recency was a critical factor. The evolution of Google into a revolutionary juggernaut of machine-learning supremacy has shuffled the deck for digital marketers. A scattergun approach to content marketing no longer works, as the search giant now rewards the most authoritative, high-quality source on a topic rather than giving preference to whichever scrambled-together article happened to be published last. Sure, it takes a lot longer to create long-form content that is loaded with supporting stats, figures, and quotes from relevant authorities on the topic, not to mention including high-quality images, engaging videos, and original graphics or charts. But the end product is exponentially more valuable to your audience, which makes it much more valuable to your marketing goals of brand growth and acquiring new leads. All this being said, inconsistent posting is unlikely to keep people interested in your business, so it’s imperative that marketers find the balance so their audience knows they can rely on your brand to deliver a steady stream of valuable, actionable content. A content hub is much more than a blog post, but a little less than a full website. Increased authority – A steady flow of trustworthy articles is the best way to position your brand as a thought leader. Greater visibility – With a content hub, you’ll have more quality pages indexed with the major search engines, which opens the door to a flood of traffic. Higher Engagement – Sales pages help you seal the deal, but there is much more to the buyer’s journey than the checkout. Content hubs help you foster trust and loyalty as you nurture customer relationships from the very beginning. In a time where it’s tougher to establish your brand online, content hubs act as digital media magnet that attracts more people to your website, which means more brand awareness, more leads, and more sales. I’m sure you’ve heard by now: video is hot. Smoking hot, actually. Cisco project that video will account for 80% of all internet traffic by 2021, and it’s easy to believe that when you look at the evidence. It’s undeniable that the world loves video content. It gets more engagement in the form of likes, comments, and shares. A portal into their brand and company culture. By using video, you give your audience the chance to see behind the scenes, and you can convey your brand story in a more powerful way. Through clever video marketing, it’s possible to humanize your brand, which is massively important in the modern age. You may be a bonafide expert in your niche, and you may have amazing content hubs that offer valuable information and actionable solutions for many people. You may also have videos gaining considerable attention on social media. But all of this may still not be enough. A lot of people need more to be convinced. Essentially, they need to know you can do more than talk – you have to prove that you can deliver. The best way to do that is through customer success stories. Almost 90% of consumers trust online reviews from other customers as much as a personal recommendation. With this in mind, companies can leverage customer success to earn more goodwill, fostering greater belief in their brand through relatable stories from real people. Through case studies, user-generated content, and word-of-mouth marketing, you can market your brand as a personable business that cares about its customers. You can show that you genuinely want to develop stronger relationships, not just for your bottom line, but so your customer’s are happier. Traditionally, a lot of online content is sales-driven, which can give off the impression that you are just another faceless corporation that cares more about money than anything else. Yes, people are that skeptical. In 2019, personalization will continue to be an essential ingredient for modern marketing success. Smart marketers have already grasped the concept of offering value to their audiences, rather than forcing the sale. One of the best modern techniques for content marketing is to view your content as a bridge. It is the bridge between your business objectives and the hopes and dreams of your prospects. Smart video marketing allows for better brand storytelling and greater engagement, and content hubs enable you to position yourself as a thought leader in your niche. However, just as you don’t want to be over-sales focused, take care not to lose sight of your goals. Strive for balance, not only between the quality and quantity of content but also in whose goals you are focused on – yours or your prospects. A solid content strategy should bring your marketing and sales departments together, and as you work towards a healthy balance, more prospects will soon arrive to see what you can offer them. Content marketing is the bridge you need. Build it and they will come. Diana Myers is the features editor of MarTech Gazette. 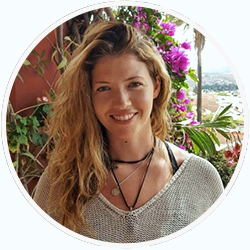 A Canadian-in-Colombia, this environmental journalist and content strategist can often be found nose-deep in a large-scale eco project. Outside of that, you'll find me exploring national parks, experimenting with herbal potions or kickboxing.